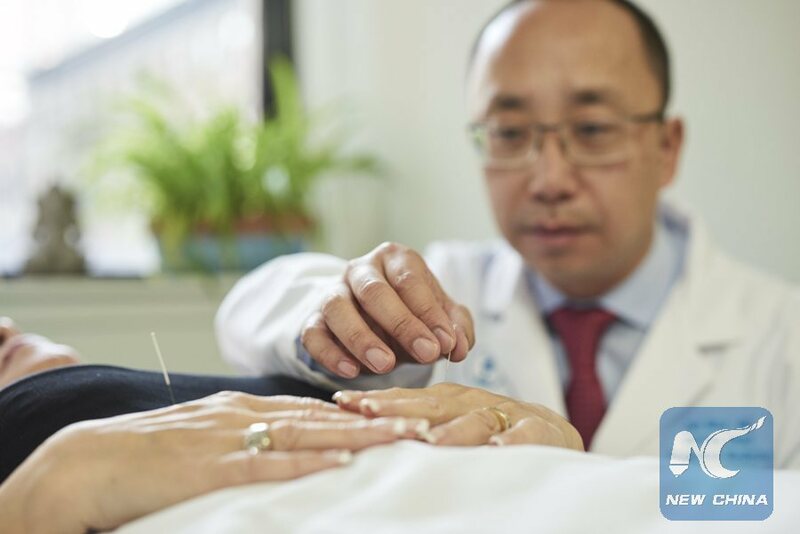 NEW YORK, Nov. 13 (Xinhua) -- Acupuncture, herbal medicine and other therapies of traditional Chinese medicine have been used more widely in the United States and can help cancer patients sustain wellness, a Chinese American integrative oncologist has said. As essential parts of integrative medicine, acupuncture and herbal medicine can help relieve pain, fatigue, nausea and hot flashes for cancer patients who have received operations, chemotherapy and other conventional treatment, said Dr. Jun J. Mao, Chief of Integrative Medicine at the Memorial Sloan Kettering Cancer Center in New York. The results of Mao and his colleagues' studies in this aspect were published in the Journal of the National Cancer Institute (JNCI) Monograph on Monday. In 2015, there were 17.5 million cancer cases and 8.7 million cancer deaths worldwide, said Mao, president of the Society for Integrative Oncology and corresponding author of the papers, adding that the past decade has seen a 33 percent increase in the number of cancer cases globally. 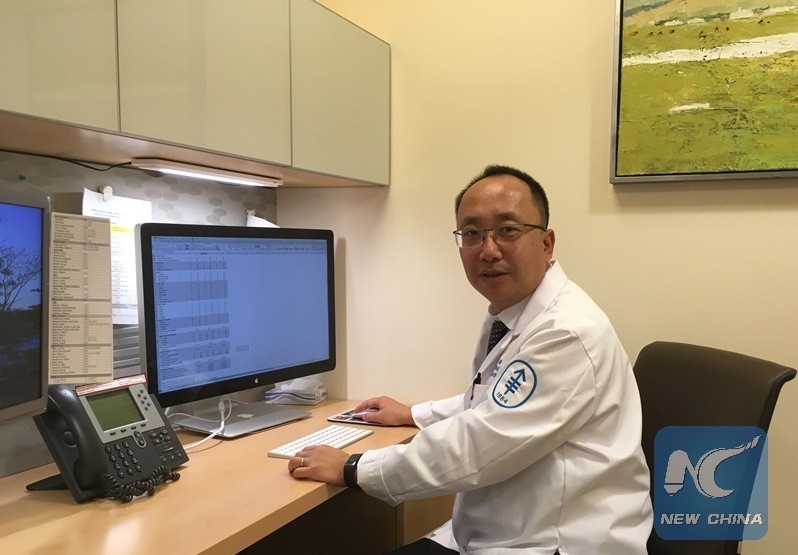 Although conventional cancer treatments have greatly reduced mortality rates, they often produce adverse effects such as fatigue, hot flashes, nausea, and postoperative pain that bring negative impact on patients' lives, Mao told Xinhua in an exclusive interview. "Here is where traditional Chinese medicine, along with other integrative medicine therapies including exercise, yoga, and meditation ... can help," he said, adding that integrative medicine only adopts those therapies supported by the highest safety and effectiveness, while never rejecting the conventional medicine. A review of 45 National Cancer Institute (NCI)-designated websites from January to May of 2016 showed that leading U.S. cancer centers increasingly present integrative medicine content on their websites, and a majority of them provide these services to patients in the same health systems, according to the study conducted by Mao and his colleagues. The study showed that exercise (97.8 percent), acupuncture (88.9 percent) and massage (84.5 percent) are among the most common integrative medicine modalities that appeared on those NCI-designated websites, while many websites provided information on nutrition (95.6 percent), dietary supplements (93.3 percent) and herbs (88.9 percent). Those figures have all increased greatly from 2009, with herbal supplements rising by 45 percent and acupuncture by 30 percent, it found. "I've had quite a number of patients who came with a skeptical attitude (to acupuncture), but became more and more convinced," said Mao, who has been using acupuncture as a complementary therapy to treat patients in the United States for 14 years. In 2015, Mao saw a 37-year-old female patient, who suffered from intense pain two years after her breast removal surgery. She had tried physical therapy and a number of medications to relieve her pain, but to no avail. "She couldn't write, hold a pen, or even hug her small children," Mao said. After four to six times of acupuncture treatment, the woman said her pain was reduced to a moderate level, and after more than seven times of acupuncture treatment, her pain was reduced to a mild level. As one-third of women suffer from pain after breast removal operation, acupuncture can help reduce pain if not totally eliminate it, Mao said. Acupuncture also can reduce the joint pain women often experience from hormone treatment as part of breast cancer management. The pain could become so severe that some patients would even try to drop the hormone treatment and risk a relapse of cancer, Mao said, adding that acupuncture works quite well to help them sustain the treatment while reducing the pain. As a sign of accepting acupuncture as a medical treatment, about 50 percent of New York City's medical insurance programs cover the fees for acupuncture treatment and physician counseling of integrative medicine, Mao said. In the United States, about 3.5 million adults, or 1.5 percent of the population, receive acupuncture each year. Cancer survivors use integrative medicine more than individuals without cancer. Approximately one in 10 cancer survivors in the United States have used acupuncture, statistics in the JNCI research paper showed. Notably, more than 60 percent of NCI-designated comprehensive cancer centers incorporate acupuncture for cancer symptom management, according to the paper. In another research study carried out by Dr. Mao and his colleagues, eight medical institutes in Beijing joined the study to determine the association between use of traditional Chinese medicine herbal therapy and survival outcomes in patients with Stage II and III colo-rectal cancer. The study showed that overall survival rate for the high-exposure group, with more than 12 months of taking traditional herbal medicine (TCM), stood at 93.2 percent in the fifth year after diagnosis, compared with 80.9 percent for the low-exposure group, who never or seldom used TCM. The effect of herbal medicine is even greater among those patients who have undergone chemotherapy, the report said. "In the multicenter study, we found that longer duration of Chinese herbal medicine use was associated with improved survival rate (disease-free survival and overall survival) among Stage II and III colo-rectal cancer survivors after their operations," said Mao. Traditional Chinese medicine is deeply rooted in China, with abundant clinical experience and a tremendous patient base, Mao said. "I would like to help conduct more rigorous research with my Chinese colleagues, and establish the scientific evidence base for traditional Chinese medicine for more people in the world." "The next step is to carry out more well-designed collaborative research in China and the U.S. to evaluate the safety, effectiveness and mechanism of traditional Chinese medicine," he said. "We hope to promote global collaborations among researchers, clinicians, funders, patient advocates, and key societal stakeholders," said Mao. "Together, we can accelerate the pace of discovery and translation to enhance the evidence-informed growth of integrative oncology and alleviate suffering from cancer worldwide," he noted.